Last week, CHS reported that the building Indian restaurant Chutney’s Grille on the Hill has called home since 1996 was destined to make way for a new four-story, mixed-use apartment building at the northwest corner of 15th Ave E and E Mercer. But we weren’t able to tell you much about what was next for Chutney’s, its owner Geogy Chacko and manager Ramchandra Poudel. No mistake — Chutney’s is still open and serving on 15th Ave E. A fear for CHS when reporting these things is that people will mentally cross a place off the list — metaphysically closing a destined-for-change bar or restaurant early. Poudel said that the restaurant has one more year if it wants to stay. The hope is to find a new home for Chutney’s. Chacko also operates a Belltown restaurant but it seems unlikely the 15th Ave E clientele would make the trek. A good neighborhood Indian joint is one part saag paneer, one part proximity. 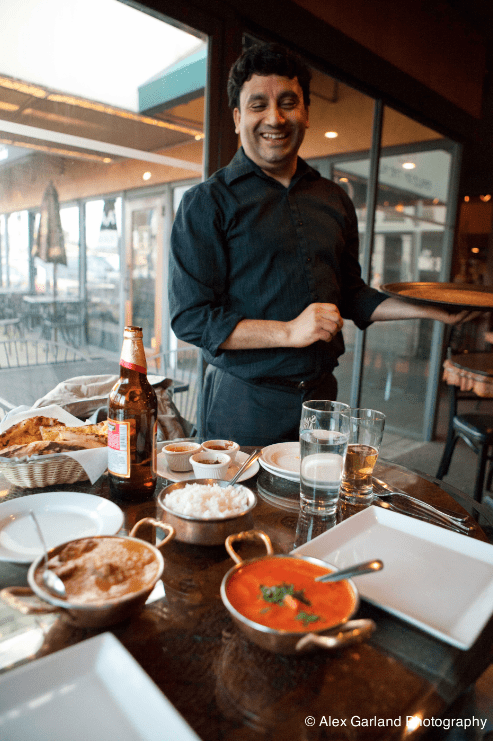 Chacko’s incarnation of Chutney’s — the “Grille on the Hill” era — began in the mid-2000s when the small chain of four restaurants was split among the Chutney’s managers. There is no plan for that kind of succession in the current Chutney’s situation but Poudel said he’s interested in building his own restaurant business someday. “I’d love to — who knows?” he said. Maybe whatever comes next will be the opportunity. In the meantime, as the apartment project enters the public design review phase and trundles its way toward demolition and, then, construction, Poudel and the Grille on the Hill will continue to serve 15th Ave E.
With all the new mixed-use buildings either planed or in development, seems like the perfect time to jump on one so it can be properly fitted with their needs. Hopefully they have no problem finding a spot that is perfect for them. I won’t miss their current space, at all. There’s also a very nice Chutney’s with an awesome patio in the Wallingford Center. I guess it was part of the split up. Where is the 7AM AA meeting going to go? I love this picture. I used to get takeout from Ram all the time. Ram’s sunny personality is on the list of things I miss about living on Capitol Hill. Ram!!! To say he’s the nicest person ever seems faint praise, but he’s the kind of person who makes me feel good about the world. The fact that he has been there almost every day, being genuinely friendly to everybody is like…awesome. After Chutney’s is gone, where will we all find him? Ram, you will be missed. Wishing you all the best. Sounds like he might go back to school — stop in and ask him!